Cazenovia College is situated in the Village of Cazenovia where you’ll find the security of small-town living combined with many social, cultural and recreational activities. 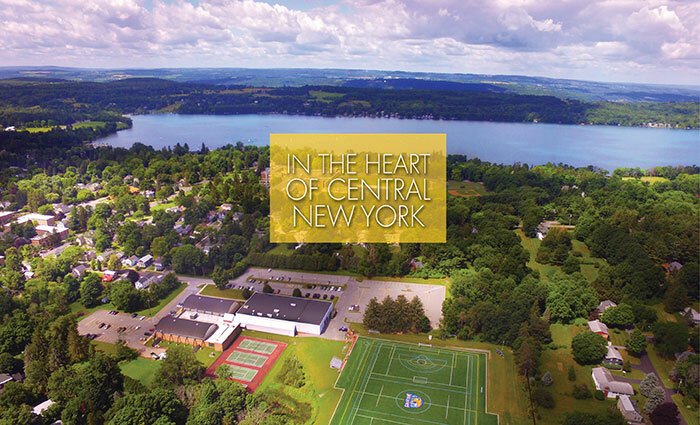 Nearby Cazenovia Lake is an integral part of the student experience at Cazenovia. Check out these venues for delicious food and great atmosphere! Love shopping? Cazenovia is full of unique shops! Try farm-fresh products from 20 East, trendy fashion at Lillie Bean, get a bargain at The Key thrift shop, or browse the many unique products from local artisans at Cazenovia Artisans and The Shoppes at Johnny Appleseed. You can’t beat the seasonal fun available at Cazenovia area farms. Critz and Our Farm offer fall entertainment including pumpkin and apple picking, volunteer to help rescued animals at Skanda, or visit the Saturday morning Farmer’s Market. So Much More, So Close to Caz! Central New York is a year-round destination, and Cazenovia is positioned directly in the center of the fun and excitement. From the farm-to-table movement, through miles of Main Street USA, the deep history of the Erie Canal, to hiking, night life, arts and more. When you live in Central New York you are able to see and do new and exciting things every week or the year. For more about the Central New York region, check out visitcentralnewyork.com. Destiny USA is New York’s largest shopping center with dining and entertainment venues. Destiny is located just 30 minutes from Cazenovia College. Turning Stone Resort offers world-class entertainment in its event center and night clubs. The Everson Museum of Art features the works of American artists from the 18th century to the present, including painting, drawing, sculpture. A three-city-block facility located in the heart of Syracuse. The venue is host to operas, symphonies and an AHL hockey team. The close proximity to Syracuse, N.Y., – just a 30-minute drive from Cazenovia – makes transportation from Hancock International Airport and the Regional Transportation Center (train and bus stations) easy. Beyond Syracuse is the Finger Lakes Region; the foothills of the Adirondacks rise just an hour north of Cazenovia; and to the south the rolling hills of Central New York’s farm country are home to several ski areas. 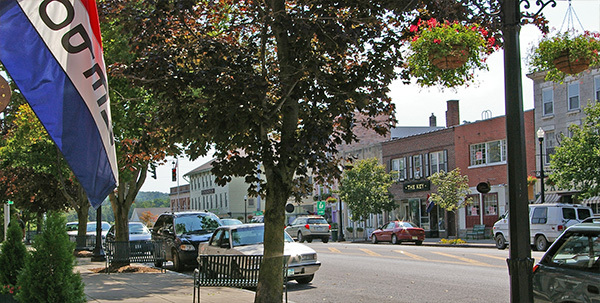 Cazenovia, N.Y. has a variety of outdoor recreation and attractions. Enjoy the many arts and cultural facilities, or plan a day full of hiking, running, snowshoeing, skiing, paddling or fishing! Find festivals, music, clubs and more all happening in the Cazenovia area. This calendar features events and activities from many local organizations. The public library located in the village of Cazenovia hosts many public events in their community room. You can also stop in and join one or the weekly games of Scrabble or Bridge. To learn more about Cazenovia and all there is to see and do, check out the Cazenovia Chamber of Commerce’s website. Their website offers information about the beverage trail, history, live music, art, outdoor activities and upcoming events. This page is provided as a service to Cazenovia College students. The page highlights local venues students may enjoy visiting throughout their tenure at the college. If you have suggestions for additional categories, business listings or corrections please email sebock@cazenovia.edu.